The Place of Magic in the Intellectual History of Europe « Ars Obscura Bookbinding & Restoration Co. Originally published in 1905, this work, after a manner, is an outline for Lynn Thorndike’s later monumental magnum opus, the eight volume set of the History of Magic and Experimental Science. This work is first and foremost a historical primer. From the Classical to the Medieval eras, the history of Magick is explored through the works and the personages of these periods. Primary source material is laid clear that comprises the primary signposts of this lineage. These being the likes of Pliny and his Natural History, to Pythagoras, Aristotle, Cato, Boswell, Galen, Seneca and Cicero’s Dream of Scipio, to name a few. Mr. Thorndike provides a thorough groundwork. The eclipse of Magick by science and yet the ageless persistence of Magickal inclinations brings gravity to the issues of the scientific questions of Magick’s evolution. In keeping with the scholar tradition, there are copious Latin and Greek footnotes throughout. ISBN: 0-9623780-9-7. 12 pp.,107 pgs., 5 ½ x 8 ½ inches. Type has been set in Garamond and Athenian. Trade Cloth Edition, gray book cloth, gold stamp on spine with jacket. $55.00. binding in burgundy kidskin. Leather headbands and black silk ribbon. Sewn marble endpapers, also burgundy. This book is hand-sewn on 2 sawn-in cords. 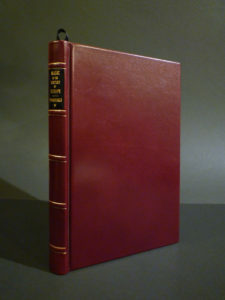 Gold gilted title and author on the spine with gilted lines parallel to the 5 raised bands. 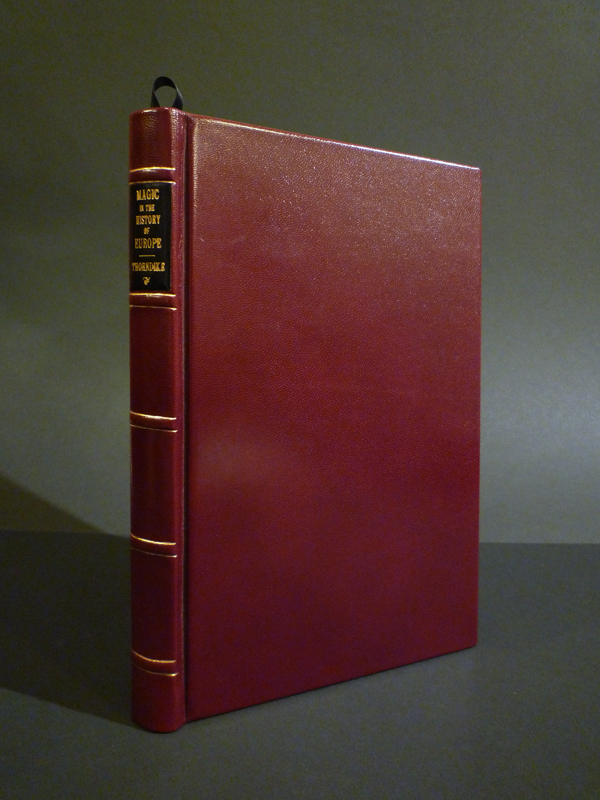 A lined (with matching marble paper) slipcase is available, but is an extra $60.00.